Here at the Forest Hill Lions Club, we must always ask ourselves, “Are we doing the best we can?” As the Lion Motto states –We Serve! On October 8, 1917, in Dallas, Texas, one year before the end of World War 1, Melvin Jones founded the first Lions Club - with a goal of helping the community and serving humanity. 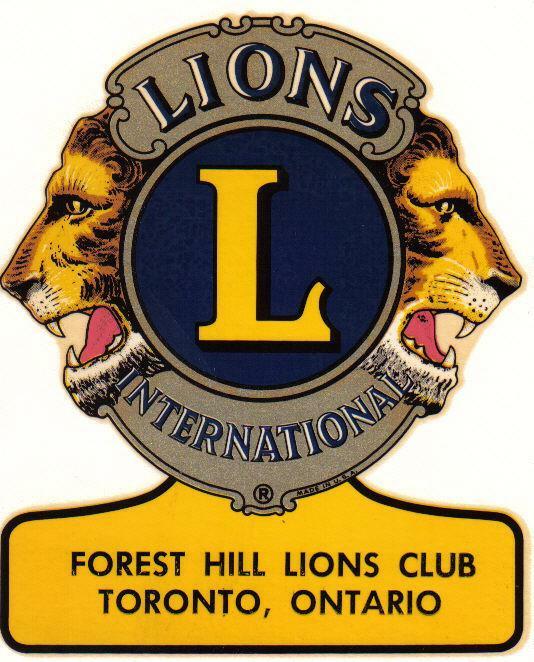 Thirty five years later in October 1952, the Forest Hill Lions Club was born, and is still active. Our simple, timeless, motto has served us well. We are a group of 32 committed individuals. Although we each come to this Club with different backgrounds, we stand united in our desire to help others - and that will always be our priority. Some people feel we should be more social. Others feel we are too social. Some want a more service-oriented direction, others want less. But, my feeling is, one goes hand in hand with the other What makes our Lions club unique, and the envy of many clubs in our district, is that we have fun in the process of serving the Community. Yes we are a social club and a service club combined. We enjoy doing what we do, kibitzing with each other and socializing on a regular basis. As Emerson once said, “Nothing great is ever achieved without enthusiasm”. It is the members of our Forest Hill lions Club whose enthusiasm has been the driving force behind these fundraising efforts in order to sponsor such worthy endeavors as the supply of medical equipment, give out holiday gift baskets, work on the Hunger Patrol, directly assisting those with special needs and becoming involved in various other charitable endeavors. In doing so we help feed, clothe and shelter many of the homeless. The Forest Hills Lions Club is fortunate to have an Executive Committee with years of experience and knowledge to guide the club. Beyond this Committee is a group of dedicated members who continuously develop and engage in fundraising projects, annual Donor Dinner and bingo events. We look forward to many future successful years serving our community. May we all be blessed with good health and happiness for many more years to come while we continue, following the words of Mother Teresa… We are doing the best we can for the people of need in our community.